This week it seems I have several Bibles to review, so bear with me. The Word of God is a powerful, sharp, two edged sword, that impacts our lives in amazing ways. I enjoy getting Bibles to review. Maybe you are wondering what I do with all these Bibles. I have kept some of them for my personal use. I gave almost all my grand-kids Bibles last year. I have also given some away to different people who needed or wanted a Bible, and I shared several with a missionary friend, so she could take them to the field with her. It just depends on the Bible, and the need that arises. But I rarely pass up an opportunity to review a Bible. This Bible is imitation leather and has a nice feel, as well as, a classy look. It is King James Version, which is actually my preferred version because that was what I was raised with and I know so many of the Scriptures by heart. This Bible was a little different than I expected, but that's not necessarily a bad thing, because I didn't really know what to expect. But so you do, here is what this Bible is like. Each page has words underlined in various passages of Scripture. Then somewhere on the page in a blue box the chapter, verse, and word are highlighted and explained. When I am studying Scripture I like to look up words in the Strong's concordance to see what the original Greek or Hebrew meaning intended. It helps to better understand the word usage in the passage. Here it is right in the Bible for you. The word is given, then the Greek or Hebrew and the meaning. There is also other passages it is used in. Some pages have quite a few words on them, but you will also have to look up some words in other places in the Bible. It will tell you where to find them if they are listed in a different location. 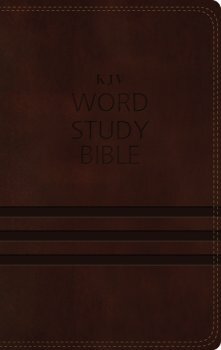 I found this Bible to be helpful in studying and understanding the words and their actual meanings. I liked the set up. The back of the Bible contains a Passage Index, a Concordance, and a Strong's Hebrew and Greek Number Index. Of course this Bible doesn't have anywhere near the amount of words included in the actual Strong's Concordance, but it does have 1,700 words and that's a great place to start. If you are interested in a deeper study and better understanding of God's word, this would be a great Bible for you. It doesn't include devotionals and such. It is simply God's Word in KJV version and the Hebrew and Greek meanings of some KEY words. I was blessed with a free copy of this Bible from Thomas Nelson and the Book Look Bloggers in exchange for a review. I was not required to review positively.